It is just sooooo! BEAUTIFUL! Beautiful, so feathery and delicate. Summer Stock Sunday is up and running - come join us! That is a perfect flower specimen! What an amazing shot! Such a beautiful color, too. It really looks like springtime. Isn't nature just amazing? Beautiful picture. Your pictures are always gorgeous - do you take your camera with you when you walk? Bermuda: I sometimes take my camera. I have three routes I walk, and so there isn't much new to photograph, but at least once a month I have it with me. I carry my camera in my purse almost all the time though. Amazing! We are on the same wave length today. I guess it's a purple kind of day - I've got some purple at my place today too! 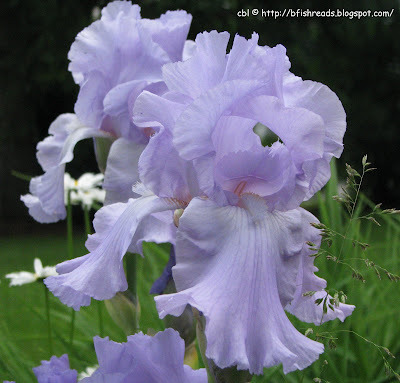 This is really pretty, such a soft color for an iris. So pretty. Gotta love this time of year! Thanks for stopping by! Ballet dancers in the mead! Was in New Jersey, you near there?? Another great flower picture. Your work is beautiful. Carissa: gardens of irises sounds heavenly! I'm in central Pennsylvania, and these flowers are in my garden. Thanks for visiting. :) Happy WW. Beautiful picture. I'm still thinking about Dame's Rocket from last week. The blue was so intense. I like the little flowers behind the iris and the green too. Oh wow, are those ever beautiful! I've never seen an Iris in that pale of a purple. They look like flowing bridesmaids on a pretty spring outdoor wedding. We have one lone yellow one at the very back of our long backyard which looks rather lonely - we'll have to plant some pretty friends like this for it next year. Lovely. Do you do any retouching on your photos? The colors are so vivid. The shot is perfect. These flowers are the last word in femininity, I think. Beautiful shot. Rebecca: Nope. I crop my photos, but other than that, they are just as they came out of the camera (memory card). Wow, so delicate and I love the color! Thank you for visiting my blog and for your compliment on my photo. Awww, don't you just love these flowers! Irises together with tulips are my favorite. Beautiful! The ruffles are just perfect! I love the pale-blue purple! So delicate. It almost looks like fabric. I will have a lot of pictures from Morocco from today on, I am back and busy, lol ! That is exquisite ... thanks for visiting mine! I always look forward to your Wordless Wednesday's posts. Thanks for another great picture! Louise: LOL! I knew what you meant! I really like irises too. Irises are my favorites, I have a bunch blooming in front of my house right now. Mine are mostly two-toned, I've never seen one this shade. It's a stunning photo! Carey/TomeTraveller used my adjective ... I was going to say "stunning irises" ... I'll say it anyway!